This article is about how to install balcony posts. There are more than one construction method for railings, depending on the railing design, but in the vast majority of the cases, you should first install the post first, then the bottom rail, the handrail, and finally the balusters. In this article we will show you ,step by step, how to make and install deck posts, as any do-it-yourselfer to be able to build its own railings, according to its needs and tastes. When you calculate the length of your balcony posts, you must take into consideration other railing components: the handrail or the amount the post will overlap the deck joists. 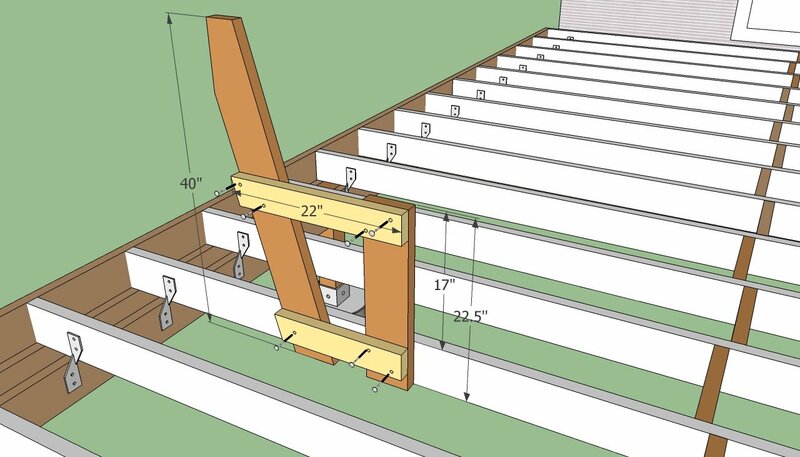 For example if you you want to build 40”/ 1 m railing, subtract from it the thickness of the handrail (let’s assume 3”/8 cm), and add the thickness of your deck plus joists (let’s assume 8”/15 cm). Consequently, you should make you posts 45”/107 cm long. Remember that these are just examples, you can build according to your tastes and needs, just follow these simple guidelines to do the job right from the very beginning. This article is about how to install balcony posts, so consequently you have to measure it, by using a tape measure. Work with great care, especially if you are not a professional. Do not walk close to the edge of the balcony and work with patience. Use a good tape measure as to make sure you tale the right dimensions. In addition, you should use a laser level to check the alignment of the post hardware. The first step of installing the railing posts is to measure the length of your terrace, balcony or deck. Afterwards you have to decide the distance you want between the post. Usually the distance between posts is roughly 3′, but in this project we have chosen to install posts at a higher distance, due to the unique design, as you will see in the following steps. Nevertheless, remember that the distance between posts must be equal, otherwise your railings won’t be symmetrical. As you can see in the image we used a chalk line in order to make sure the posts are perfectly aligned. Afterwards, we used a permanent marker to mark the spots where to drill holes, in the concrete surface. However if you have a wooden surface, then the post should be anchored to the deck joist with lag screws and washers, checking the level and adjusting it, if necessary. Pre-drill the posts with holes for lag screws, as to avoid splitting the wood. In addition use a countersink, to hide the bolts heads. 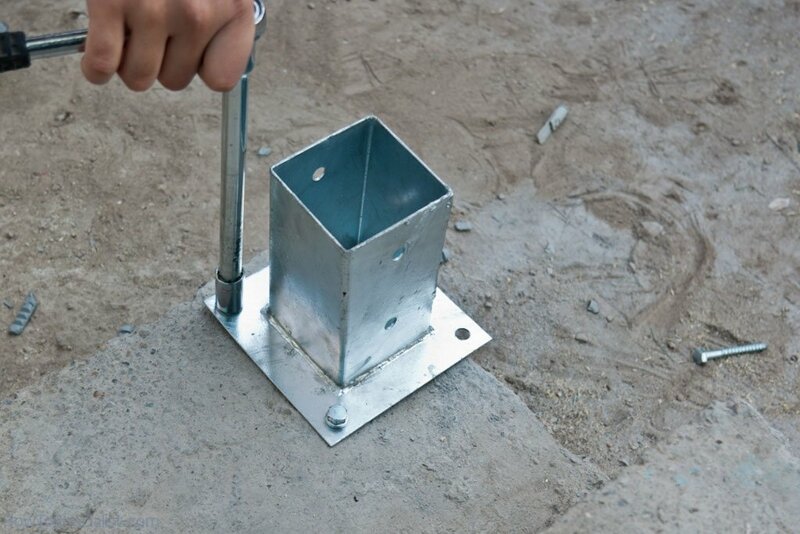 Next, use a good drill with hammering function and make the necessary holes in the concrete surface. The drill size should be chosen according to the dowels and screws are going to use, as in most cases it is written in their instructions. The drill machine must be hold with one hand like a gun, with the index finger on the start button. With your other hand hold the drill’s handle firmly, in order to have greater control. The drilling must be progressive: at first use low speeds to create a shallow hole. Afterwards, the speed should be increased, but at every few seconds pull the drill slightly out and press it back in again, not to block her in concrete. Install post hardware also against the house, for better rigidity of the railings. In order to fix the hardware, we used lag screws, together with washers. Remember that is important to use washers, as they fix firmly the hardware anchors. If during drilling, the drill-bit heats, then take a break for few minutes to allow the drill bit to cool off, otherwise you risk damaging both the machinery and the drill bit. The next step after installing the post hardware, is to fasten the wooden posts. In order to avoid splitting the wood posts, we have made several pilot holes using wood drill bits, and a drill machinery. Remember that in this case, the drill bit size should be smaller than the actual size of the screws, you will install. It is quite dangerous to dill through the hardware holes, so we recommend you to mark the holes, making sure the post is leveled, and then drill in the wood post, using a saw horse. Next, fasten the wood post using 2” wood screws, washers and a key. Install as many bolts as possible, for a proper installation. Do not use too much force when tightening the screws, as you can easily split the wood. Work carefully with a lot of patience. Smart Tip: when installing the post against the house, use some sanitary silicon, as to prevent water infiltrations between the wall and the post – it will protect both the post and the walls on the long run. In this image you can see the post against the house, fixed in the hardware, but also anchored in the wall. In order to fasten the wooden post into the wall, just make a pilot whole in the post and in the wall, and use a long screw (8”/20 cm). In order to hide the bolt head use a countersink. In this way, the railing posts will look very nice, and they will be secured to the wall. Make sure the post is well-leveled, and use a ratchet wrench to fix the lag bolts. In order to lock the post against the house, use a drill with torque control, as to tighten the screw as much as possible, without splitting the wood. Use two screws, one at the bottom of the post, the other one at the top of the post. In this way, the post will be perfectly locked into its position and you can start installing the rest of the posts, or the railings and balusters. Continue the process by installing the rest of the railings posts, using the same techniques. Make sure you work in safe conditions: the area must be well lighted, you should use safety gloves and glasses, and work with good judgment. The railing posts must be installed perfectly straight, so use a level to determine their best position, lock them into position and then fasten them with lag screws. In addition, check if the top of the posts are perfectly aligned, otherwise the handrail won’t be leveled. In addition, the space between the posts must be equal, so make one last check before fastening the posts with screws. You should work carefully, always making two measurements, as to make sure you don’t waste any materials by making a wrong cut, or drilling a wrong hole. Thank you reading our article on how to install balcony posts, and we recommend you to check out the rest of the deck projects. Please share our articles with your friends, by using the social media widgets.